The story of the Bosque Escuela begins in 2003 when Casa Pueblo acquired 150 acres of land through their own efforts. Ten years later, on August 2013, the Bosque Escuela La Olimpia ‘Ariel Massol Deyá’ opened its doors to students and the general public, creating a unique and magical educational space, at the top of the mountains, sheltered under a dense canopy, under the echoes of Taíno ancestral voices. Its educational philosophy is based on having atypical classrooms where “the ceiling is made of sky and the walls are made of trees.” Lectures are not to be recited or memorized. Instead, the forest serves as a laboratory with infinite resources. Students learn to apply the scientific method, to develop their own ideas, and their critical thinking skills; in other words, they are encouraged to sharpen their senses, develop their own hypotheses, gather facts and data, and ultimately analyze and interpret the evidence. The Bosque Escuela offers different educational experiences to its students. Through a mutual agreement, nearby schools bring their students two days per month to experience a state-of-the-art curriculum that includes classes in biodiversity, insects, hydrology, water quality, agroponics, fungi, and the scientific method, among others. The school is also open to students from all over the island who can visit for a “one day experience”, and while they hike and enjoy the beautiful scenery, they are given synopses of various lessons. Interactive learning and discovery takes place at the Olimpia Forest. During the fall of 2013, an innovative course on renewable energy was taught, where students took temperatures measurements within and outside of the forest to quantify the cooling effect of the trees. Combining play and exploration, the students applied thermodynamic principles and calculated that, per acre, the cooling effect of the tree cover is equivalent to energy savings of 8.85 kilowatt-hours, which translates to a reduction of $66.41 per month or seven units of air conditioning (of 12,000 BTU). Students reached these conclusions through hands-on research and personal discovery, not because they sat in a lecture and “somebody told them”. Besides recognizing the microclimate generated inside the forest due to the dense canopy, students made correlations on how this is analogous to having a “green roof” at the top of a building, which provides thermal insulation and reduces energy consumption. In addition to having a rich science and engineering curriculum, the Bosque Escuela also aims to build students’ confidence and creative nature. Classes, for example, require students to use scientific illustration, oral communication, poetry and songs as part of the course and their assignments. University courses are also taught at the Olimpia forest. This is the case of the short course in “Biodiversity and Microbial Ecology,” offered every year by professors from the University of Puerto Rico-Mayaguez and the University of Idaho. This course has been offered for more than a decade and in recent years it has evolved to “Microbial Ecology, Culture and Society" with the goal of developing socially responsible scientists and professionals. Other college courses offered include: “Advances in Environmental Restoration”, “Agriculture and Biodiversity” and “Bioethics” which have been taught by professors from Michigan State University, Rutgers, the University of Washington, and the DOE Lawrence Berkeley National Laboratory. In the area of environmental restoration, the forest serves as the habitat for endangered species, such as the sharp-shinned hawk (Gavilán de Sierra) and the broad-winged hawk the (Guaraguao de Bosque), as well as other endemic species, such as the Sierran palm (Palma de Sierra) and the Clusia glundachii Satahl. Visitors and students learn about the state of these species. For example, did you know that there are fewer than 125 broad-winged hawks left in Puerto Rico? Casa Pueblo also works alongside other groups to help protect the forest’s drainage basin, as well as the Río Grande deArecibo watershed, whose headwaters lie in the Olimpia Forest. This river supplies water to more than a million residents in the north of the island, including the densely populated metropolitan area. Agroecological conservation is the Olimpia forest’s mantra. This practice differs from the usual management of “protected areas,” where the citizens are held away from the environment. The Bosque Escuela welcomes students and visitors for recreational activities where they enjoy the forest while learning sustainable agricultural practices. In this way, the public develops a stronger relationship with the land, and individuals feel connected with their environment and more inclined to protect it. The Forest also serves as research center, having an “in-house” meteorological station with an emergency alert system. At the station students take measurements of ambient temperature, liquid precipitation (rain), and other weather related parameters. Graduate students (M.S. and Ph.D.) also use the forest for their thesis research. Exemplary projects include a comprehensive inventory of the forest’s flora and fauna and a study of the water quality and community structure of algae and invertebrates in the Ciénagas River. At the “Bosque la Olimpia,” the environment is enjoyed, managed and protected, all at the same time. Casa Pueblo has mastered this integrative, balanced and sustainable model throughout more than 35 years of community-based work and colossal environmental defense efforts. Thanks to their successful initiatives, the Bosque Escuela has impacted more than 6,000 students since its creation, the forest has been incorporated as part of the International Model Forest Network, and the architecture of its classrooms have been internationally recognized. Other countries have adopted the Adjuntas’ Forest School as a model for their efforts. This is the case of the Tropical Agricultural Research and Higher Education Center in Costa Rica. The forest’s original curriculum, developed following the ECA approach (exploration, conceptualization and application), is also a pedagogical milestone. 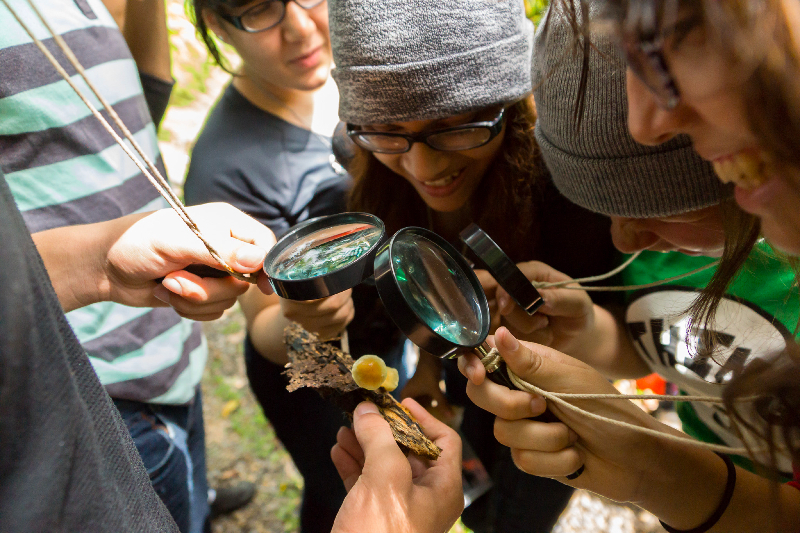 Through this educational program, Puerto Rican students not only develop solutions to scientific questions but also to social and community relevant problems; they not only look for innovative solutions, but also ones that are sustainable; students not only learn the basic concepts but they challenge them in order to evaluate them through personal discovery. Dr. Arturo Massol Deyá, President of the Board of Directors of Casa Pueblo, as well as a member of Ciencia Puerto Rico, strongly, believes that the Forest School model can be adapted and implemented in any municipality of Puerto Rico and in any country in the world. When asked about the future of the Bosque Escuela, Arturo says that “just like in nature, projects come to life, they evolve, grow and advance…” Arturo cannot separate the project’s tangible and physical aspects from its natural attributes, and that may be the best description on what lies at the heart of the Forest School. In the forest, Professors Flora and Fauna dictate the lessons. In this forest transformed into a school, the seeds of a brighter future for younger generations are planted. The forest is powerful. It nurtures the soul and the intellect. Like Arturo says: “The forest is our greatest teacher”.